One of the most decorated Welsh soldiers of World War One has been recognised with a plaque at the former steelworks site where he worked. John Henry Williams received the Victoria Cross and three other medals for his bravery during his time in the army. Brig Philip Napier, Colonel of The Royal Welsh, described him as an "outstanding man". The plaque was unveiled in Ebbw Vale, Blaenau Gwent, on Saturday. Company Sgt Maj John Henry Williams was born in Nantyglo in 1886 and started working at the Ebbw Vale Steel, Iron and Coal Company at just 12 years old. He joined the 10th Battalion of the South Wales Borderers and in July 1916, during the Battle of the Somme, was part of the 38th (Welsh) Division sent to clear Mametz Wood. He was later awarded the Distinguished Conduct Medal for "conspicuous gallantry in action" and received the Military Medal for bravery the following year during the Battle of Passchendaele, The Third Battle of Ypres. A year later he helped a wounded comrade through a battlefield of shrapnel and bullets at the Armentieres in 1917, which won him an added bar on his Military Medal. 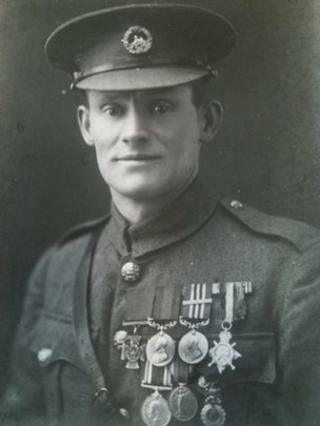 In 1918, at Villers Outreaux, CSM Williams stormed an enemy machine gun post under heavy fire and took 15 prisoners. He secured the position for his regiment - an act that won him the Victoria Cross. He also received much praise from the media. An article in the London Gazette in December 1918 described him as having "conspicuous bravery, initiative and devotion to duty". It continued: "By this gallant action and total disregard of personal danger, he was the means of enabling not only his own company but also those on the flanks to advance." But leg and arm wounds led to his medical discharge from the army in October 1918. Three months later he was awarded the French equivalent of the VC, the Medaille Militaire. When King George V presented CSM Williams with four of his medals at Buckingham Palace in February 1919, it was the first time the king had awarded so many to one person in a single day. The former steelworker later returned home to Ebbw Vale, but 400 of his colleagues never made it back from war. Upon his return, the owners of the steelworks gave him a house and granted him a lifetime supply of coal and electricity. Now a commemorative plaque has been unveiled in his honour at the General Offices building, which was formerly the administrative hub of the steelworks, but now houses the Gwent Archives. Brig Philip Napier paid tribute to an "exceptional" soldier. "In the year that we start our commemorations of the centenary of the First World War, it is very appropriate that we acknowledge the bravery, initiative and dedication of this outstanding man," he said. "To win the Victoria Cross, the highest decoration for bravery, as well as three other gallantry awards is quite exceptional. "CSM Williams remains the most highly decorated Welsh NCO and an example to us all of what our Welsh soldiers can achieve."